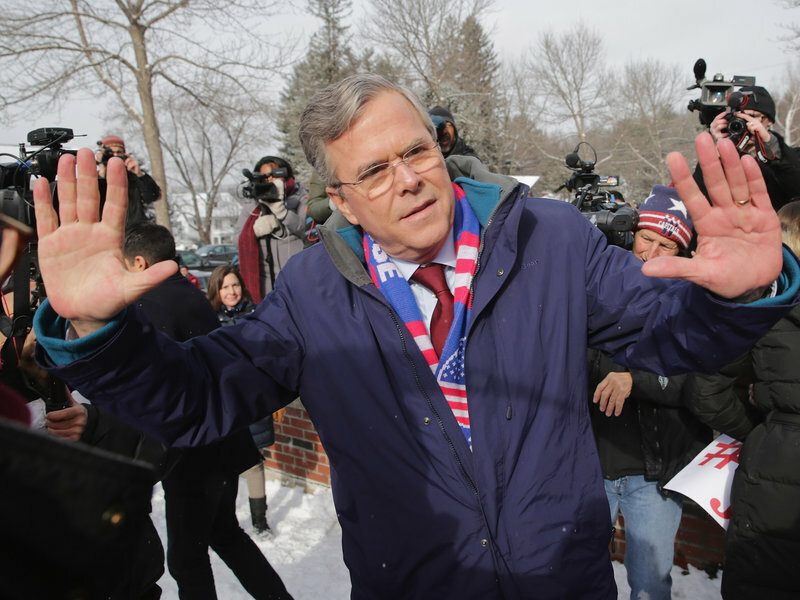 New Hampshire could be Jeb Bush's last stand in the 2016 presidential race. Here, the Republican presidential candidate thanks his supporters outside the polling place at Webster School on February 9, 2016 in Manchester, New Hampshire. We&apos;ll consider the real reasons to stick around in a moment. But for several candidates, whether they make it official or not, the Granite State will be the rock on which their ships ran aground. Their campaigns may stagger on into a zombie phase, but it will not affect the outcome of further proceedings. On the Democratic side, both Bernie Sanders and Hillary Clinton will continue on to the Nevada caucuses of Feb. 20, regardless of the outcome or the margins in New Hampshire. Sanders and Clinton will meet in Milwaukee for a debate on PBS Thursday night. Their erstwhile third wheel, Martin O&apos;Malley, already suspended his bid after the Iowa caucuses, and two other long shots (Jim Webb and Lincoln Chafee) quit last year. The reaper is nearer in the Republican field. The end of the dream may come for any of six candidates who desperately need at least a respectable finish in New Hampshire. That is a hefty majority of the nine remaining Republican candidates who have appeared in at least one of the party-sanctioned, televised debates. For those Republicans who qualify for Saturday night&apos;s debate in South Carolina (which will air on CBS News), there is always a chance of turning things around in that state&apos;s vote on the following Saturday. In any event, there is a chance of being seen one more time. Not everyone may make it onto the CBS stage, of course, and some might scarcely be missed. Jim Gilmore, the former Virginia governor, has been in and out of the TV debates, and his campaign appearances have been limited. Having barely registered in Iowa, he has had little visibility in New Hampshire. He may think this will change south of the Mason-Dixon Line, but evidence for this is scant at best. But several other contenders who have been far more important to the real discussion may also be seeing the checkered flag signaling their final lap. Carly Fiorina, the firebrand former corporate executive, flirted with top-tier status in the early going and battled her way onto the main stage of the debates. But her over-the-top claims about Planned Parenthood, never substantiated, tied her to an issue that was losing altitude by the month. Fiorina tried to compensate with increasingly personal attacks on Hillary Clinton. Surefire applause lines in the debates, these sorties did not reverse her decline in the polls. She was excluded from the ABC debate the weekend before New Hampshire, and she is not expected to rise above single digits in Tuesday&apos;s vote. 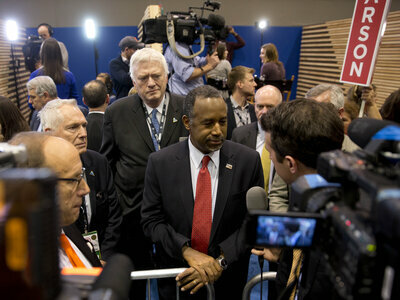 Ben Carson, the pediatric neurosurgeon, has also been losing ground in recent weeks. His share of time in the debates has dwindled as his poll numbers have drifted downward, generally since the Paris attacks on November 13 shifted the issue mix to emphasize national security. In the last debate, Carson had less camera time than anyone on stage, less than half as much as the leaders. He also suffered some embarrassment when he could not hear his name called and failed to come on stage when introduced. The famous physician from Baltimore may look past a poor showing here to pin his hopes on South Carolina. Or he may bow to what looks inevitable. Chris Christie has been a major factor in New Hampshire, and it will be ironic if he fails to reach double digits or finishes below the top five in New Hampshire. 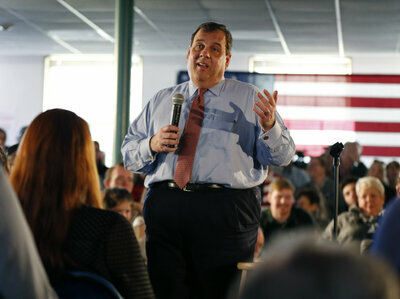 Christie had his best debate of the whole six-month season last Saturday night, skewering rival Marco Rubio as a robotic speechmaker who had never made any real executive decisions. If Rubio&apos;s rapid rise hits an air pocket in New Hampshire, it will be because of that surface-to-air strike from former prosecutor Christie. But it is entirely possible the benefit of that will go to other candidates, such as John Kasich or Jeb Bush, who had been polling closer to Rubio than Christie. Gilmore, Fiorina, Carson and Christie all seem to be "on the bubble" as the actual primary voting begins. But there also exists the possibility that one or two other Republicans will hit a pot hole at just the wrong time. John Kasich, the governor of Ohio, has campaigned in the Granite State as much as or more than any other 2016 hopeful. He has clearly found an audience here, and he has won some editorial backing as well. Late polls showed him making a move. If he were the only option aside from Donald Trump or Ted Cruz — or even aside from Trump, Cruz and Rubio — Kasich might well be in the sweet spot. But he is splitting that "mainstream Republican" role with several others, including two other relatively pragmatic governor-types from the Eastern seaboard. Kasich may do well enough to stake a strong claim on the vice presidential nod. If he does not do well, such as in challenging for second place, New Hampshire may well be the end of his formal campaign for the top spot on the ticket. Jeb Bush might once have expected to have this day be a blazing victory, compensating for a lackluster showing in Iowa. But his finish in Iowa was less than lackluster, and his prospects here, while better, are far from blazing. As the scion of America&apos;s best-known Republican dynasty, Bush&apos;s realistic hopes of the Oval Office will not survive a second setback. A loss seems inevitable, but the actual percentage and place in the finishing order will matter a great deal. The first President Bush won here in 1988 and 1992, but the latter year saw him share the primary vote with his upstart right-wing challenger, Pat Buchanan. The second President Bush was embarrassed here in 2000, losing to Senator John McCain by 20 points. But the other "Bush Boys" moved on in every case to a solid win South Carolina, thus setting a sure course to the nomination. A win in South Carolina now seems well out of reach for Jeb Bush, who is not polling in the top three there. The last several days have been a kind of family reunion for the Bush clan here. Bush has had his mother and brother here to campaign for him. The Bushes have also welcomed many veterans of previous Bush administrations as sober-minded, sensible surrogates. Older, more traditional New England conservatives may still feel more comfortable with a Bush than with Trump or the Tea Party heroes of the new Republican wave. But that alone may not be enough to lift Bush much past New Hampshire&apos;s threshold of 10 percent. Bush has vowed to press on to South Carolina regardless of the results here. But one has to wonder if this vow will hold if he fails to crack the top three or four in New Hampshire. Rumors have swirled of a reassessment coming after today&apos;s results are in. Trailing as he has in South Carolina, it is not clear where Bush would get his candidacy back on track before the Florida primary on March 15. And even that home field advantage may not be enough against whichever candidate is leading at that time, especially if it turns out to Rubio, the Florida senator who was once regarded as Bush&apos;s protégé.